Two Social Workers from York and Calderdale Councils are bridging the gap between theory and practice through working as Lecturer Practitioners. This new role, developed by the partnership, offers practising Social Workers the opportunity to teach part-time on academic courses within our partner universities. 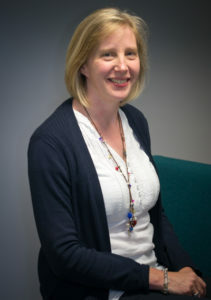 Jennifer Cooper has joined the University of Huddersfield part time from a Child Protection Team within Children’s and Adults Services at Calderdale Council. “Having worked alongside Social Work students in my team, they have at times spoken about how they did not feel that their university courses prepared them for life in practice and they struggled to understand the links between theory and practice. I felt that I could bring my knowledge and practical experience of Social Work into an academic setting to try and bridge the gap. I have found that in my lectures and seminar groups that case studies are helpful but hearing about the application of method or intervention in ‘real life’ provides a deeper learning experience for Social Work students. Having a practitioner involved in teaching means students can explore situations in more depth and gain the benefit of reflection. Joanne Chaplin, a Children’s Disability Social Worker at City of York Council has joined the team at University of York part time. “I believe there is enormous scope and potential for the Lecturer Practitioner role. After I re-trained at the age of 30 and wondering, in the first term, if I had made the right decision my first placement and Practice Educator pulled me through. The Lecturer Practitioner Role gives me the chance to offer what I have learnt over the years to help more Social Work students starting out in their careers. Students love to hear about ‘real’ cases and relish the opportunity to ask questions. I see this as an opportunity to make a contribution in a range of ways, from formal teaching to workshops modelling what a current Social Worker is and does. It’s important to be passionate about this line of work and that often gets hidden under the day to day stresses of practice. Listening to students’ differing perspectives on the role of the Social Worker has really prompted me to be more reflective about my own practice and given me fresh ideas for approaching my work with families”. University partners have fully supported this model of delivery, recognising the immediate and longer-term benefits for students in delivering an academic experience reflective of local practice. “The Lecturer Practitioner role is hugely valuable in preparing Social Work students for practice. The Lecturer Practitioners are able to bring practice issues to life with critical discussion that centres on contemporary, local practice and local issues.” – Social Work Subject Leader, University of Huddersfield.